Pastor Benjamin (or Ben) began his ministry at the Community Church in August 2016. Ben comes to us with his wife Brooke Bell and their son, Marin, and daughter, Sophia, from Colorado Springs, Colorado, where he served for 17 years at The First Congregational Church. They are happy to return to Northern California – Ben grew up in Santa Cruz and Brooke is from San Jose. He and Brooke met for the first time in our Pilgrim House in 1997, at a meeting of counselors for Camp Caz! In addition to ministry, Ben loves playing guitar and ukulele, listening to live music, beach cruiser bicycles, craft beer, speaking Spanish and traveling. Emily Syal joined our staff as Youth Coordinator - directing our Middle School and High School Youth Groups. Emily grew up in Wisconsin, loves cheese, and was living in Michigan before moving out to the West Coast. She enjoys hiking and being outdoors, so much so that Emily has brought the outdoors into her apartment with a small vegetable garden and 30 houseplants. Emily shares the apartment with her husband, a cat and a husky/lab mix dog. She is in her third and final year of seminary at Pacific School of Religion in Berkeley with the goal of becoming a pastor in the UCC, or working forever in youth ministry (or both)! Julie Reimer joined the staff of Community Church in January 2019. In addition to Sunday mornings, she is usually in the church on Tuesdays and Wednesdays Julie and her husband Russ, moved to Sonoma County in 2016 and divide their time between their house in Rohnert Park and their cabin on the Russian River. They have 2 adult children. Prior to moving to California, Julie served as the Director of Christian Education for Avon Lake UCC in Avon Lake, OH. She is thrilled to have the opportunity to work in children's ministry again. Becca is in the office Monday through Friday from 9:00 am to 2:30 pm and can help answer most of your questions, or find someone who can. Have a facility or calendar question? Becca is the person to ask. Becca just started working at Community Church. She grew up in California but has lived in many places, landing in the North Bay a few years ago. She keeps busy with her four children and many school and church volunteer opportunities. Jennifer Halleck joined our staff in April 2014. Jennifer has three sons who all participated in our youth groups, summer camps and apple pies, so she is familiar face around the Community Church and she brings with her a wealth of bookkeeping experience. Maria comes to the Community Church with a wealth of experience taking care of commercial cleaning accounts. She works during the day on Fridays and afternoon/evenings Saturday through Tuesday. This schedule provides important coverage for our church and works best with her family and childcare needs. To leave a message for Maria, please contact: the church office. Rev. Brian Plaugher earned a Masters of Divinity from San Francisco Theological seminary in 1987, after and served as pastor in Presbyterian churches and, for 17 years, as pastor of the Community Church, UCC, in Guerneville. He has been our Minister of Music since 2005, supporting our music program where he leads the Chancel Choir, Wind Ensemble and Jazz Band. As our Minister of Music, Brian coordinates worship music with the directors of the Handbell Choir, the Children's Choir, Acoustic Folk Group, the Divine Connection and a wide variety of other music. As part of the Safe Church Policy, and from a desire for our members to attend worship services regularly, the church has hired three Nursery Attendants. The Safe Church program requires that we have two adults (background-checked, over 18) working with our children at all times. We welcome Patricia Bower, Jenna Canfield, and Traci Harris to our Nursery Staff. We are delighted to welcome these safe, calm, patient, experienced child care providers to our Nursery program. If you have any questions or concerns about our childcare program, please contact Julie Reimer. J. Althea has joined our staff as Pianist and we are delighted to see her at the keyboards on a regular basis on Sunday mornings. 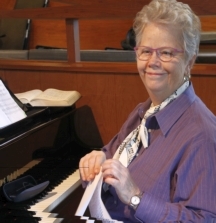 Althea has worked in music and theatre for 45 years, as a professional pianist, actress, theatre director, music director, playwright, arranger, composer, and piano teacher. Althea has also been playing in churches for the last two decades. Having returned to her native Bay Area from 36 years in Alaska, she works with various Bay Area regional community theatres and high school drama departments. Althea is absolutely thrilled to be at Community Church!